Suffolk County, NY - October 23, 2018 - Suffolk County Executive Steve Bellone today announced an agreement with the Central Pine Barrens Commission to accept the donation of a Polaris All-Terrain Vehicle (ATV) for use by the Suffolk County Police Department. The Police Department, which participates on the Pine Barrens Commission Law Enforcement Council's Multi-agency ATV Task Force, helps address illegal ATV operation along with state and local partner agencies. The new vehicle will augment existing equipment and resources that the county deploys in the Pine Barrens region to preserve and protect open space. 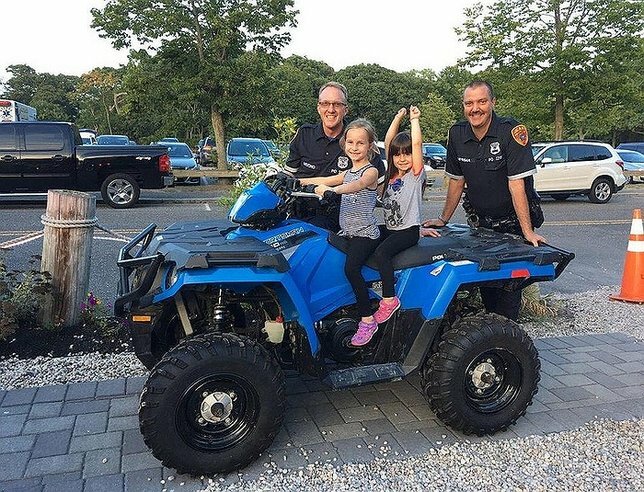 The vehicle, which is a 2018 Polaris ATV, is worth approximately $6,200 and will be owned and operated by the Suffolk County Police Department in conjunction with the Suffolk County Parks Department. The Multi-agency ATV Task Force patrols the 100,000 acres of densely wooded preserved lands in the Central Pine Barrens spanning from Hampton Bays to Setauket. All-terrain vehicles are used in these undeveloped off-road locations to respond to a wide variety of calls for service including injured persons, brush fires, overdue hikers and other searches including trespassing on public and private land, and the illegal operation of dirt bikes and ATVs. ATVs can be deployed at any time to specific calls for service or for general patrol of these otherwise inaccessible areas. Park Rangers patrol the Pine Barrens Region year-round. In 2017, a record number of 75 illegal ATV and off road vehicles were impounded up from 64 in 2016. Additionally, 157 ATV related summonses were issued. In 2017, more than $45,500 was redeemed and collected from the impounded ATVs, a significant increase from $27,245 the year prior. In addition to utilizing ATV patrols, the Suffolk County Police Department also employs an aviation patrol strategy to compliment ongoing efforts details and provide additional support to protect and preserve the central Pine Barrens region. The Pine Barrens Commission Law Enforcement Council's Multi-agency ATV Task Force is comprised of DEC Environmental Conservation Police and Forest Rangers, New York State Troopers and Suffolk County Park Rangers, Police and Deputy Sheriffs. The agencies patrol the pine barrens in teams of two with multiple teams going out each weekend searching for illegal activities in the woods. The Multi-Agency ATV Task Force Detail, organized by the Central Pine Barrens Commission, is lead by Arthur Pendzick, a longtime Suffolk County Park Ranger who has served as the Chairman of the Suffolk County Pine Barrens Law Enforcement Association. Since the Pine Barrens Law Enforcement Council’s Multi-Agency ATV Task force details were implemented 1,215 illegal ATV’s have been impounded with 3,046 ATV related summonses being issued. If you observe or are aware of any potential violations in the Central Pine Barrens that are not life threatening or an emergency requiring immediate response, you are encouraged to report them immediately by calling the toll free hotline 1-877-BARRENS (1-877-227-7367) which is staffed on a 24/7 basis by the Suffolk County Sheriff’s Office. This number can be used for reporting patterns of illegal activity or single incidents. Subject: LongIsland.com - Your Name sent you Article details of "Suffolk County Executive Bellone Announces Enforcement Actions to Protect Pine Barrens Region"